I have had great experiences with canned micro-brews lately, mostly in the forms of what Oskar Blues Brewing has been putting together, so I made an investment into one of New England Brewing Company's offerings. 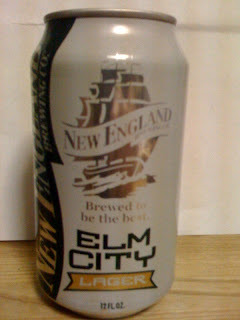 My experience with the Elm City Lager had an inauspicious start as once I cracked the beer open I was treated to a never ending volcano of foam, suds, and barley. This wasn't the best of first impressions, yet this 15 seconds of fun was the most exciting element of this beer. While I can save my Dale's Pale Ale for my finest brew ware china and feel totally comfortable in that decision, I do not feel the same about the Elm City Lager. The Elm City, lest you find it's original packaging inadequate, should not be served in anything better than a generic brand red Solo Cup, as a Solo cup would be wasted on this swill. The distinctive aroma is reminiscent of a stale belch from a two day old keg that has been left out in the sun. The taste is a watery knockoff off the mass brewed lagers commonly found in your grocers' 30 pack aisle. The ABV, a surprising 5.0%, would be a plus, one of the few, if any pluses. I can, with good conscience, rate this beer a 0.5, the lowest so far on the site. I've had a couple of others from this brewery. They seem to use the fact that their beer is in a can as their main gimmick. Flavor and quality are lacking in general. I also had the difficulty with the over-carbonated cans. These beers should come with towels to clean up the 25% of the beer that ends up on your counter.